Original Sin is the Marvel event currently in progress officially complete, centering around the mysterious murder of Uatu, The Watcher. The event began on April 23, with the release of Mark Waid’s prologue, Original Sin #0. I have documented the reading order for Original Sin as books were released with suggested placement and a quick ranking on whether or not the tie-in is one you need to read. Original Sin makes everyone’s life quite a bit easier with two trade collections that pretty effectively capture the event. The first collection of the core series includes a Point One Watcher story, Original Sin #0 – #8, Original Sins #1 to #5, Original Sin Annual #1, and the Original Sin: Secret Avengers Infinite #1 and #2. Original Sin #0: Who is The Watcher? In case there was any doubt, this prologue to Original Sin from Mark Waid & Jim Cheung offers some pretty essential background into Uatu the Watcher. Not even just the usual “I grew up on a planet of Giant Bald Men” back-story, but a look at what Uato does (and collects) in his spare time. All this seems to be coming into play in the ongoing Original Sin series now. There will be a moment reading Mighty Avengers #10 where you think to yourself: Blade sure is fighting a lot of Were-Roosters. There will be a second moment when you think: Wait, what? WHAT?!! None of that has much to do with Original Sin, but it’s a pretty fun opening 4 pages nonetheless. The tie-in portion of this issue stems from a nice eulogy from Uatu’s watcher-wife, Ulana, as well as Luke Cage, Falcon, and Spectrum with a battle leftover from Original Sin #1. If you don’t know anything about Ulana, I suggest Matt Fraction and Mike Allred’s excellent Marvel NOW! take on FF. Released after Original Sin #4, I would actually recommend Nova #18 immediately after Original Sin #2. The vast majority of the issue takes place following the heroes battle with the Mindless Ones (and friends!) in issue #2. 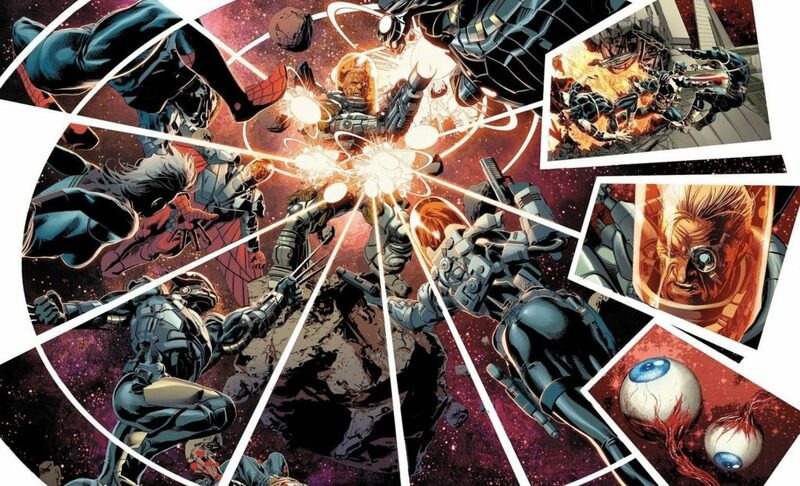 Strangely, Nova #18 actually showcases more of the actual battle than what we see in the primary Original Sin issues. A quality tie-in all around. Released after Original Sin #4, and sub-numbered Original Sin #3.1 by Marvel. I would actually read this issue in the aftermath of Original Sin #2, and certainly before Avengers #29 based on the interactions between Captain America and Iron Man. I’m not crazy about the general plot direction of this Hulk vs. Iron Man tie-in (at this point the most shocking storyline would be if Tony Stark did something good for the Hulk), but Mark Waid and Kieron Gillen hopefully have some tricks up their sleeves. This one’s a little tricky, but I’d go ahead and continue reading the story rather than breaking it up by publish date (this issue isn’t actually released until after Original Sin #5). Almost entirely flash back. The more Hulk vs. Iron Man moves into the present day, the harder it is to reconcile with Iron Man’s place in Avengers #29. Nonetheless, you can continue reading this series straight through without any Original Sin overlap. Hulk vs. Iron Man ultimately plays out more satisfying than I would have guessed. In theory, all of the events in these issues could occur before Iron Man interacts with Captain America in Avengers #29. Although this is marked Original Sin #5.1 and published after Original Sin #5, the issue can be best read in the aftermath of Original Sin #2 (I can’t even begin to explain why it’s suggested alongside issue #5). Must take place before Avengers #29 based on Thor’s presence in Asgard. Once you start Thor & Loki, you can carry on with the series (at least so far). At the latest, you’ll want to read this before Original Sin #4 based on Rocket Raccoon’s appearance. I’d also recommend brushing up on your Bendis Guardians of the Galaxy (particularly the Angela issues beginning with GoTG #5). See above. This series is now entirely under the Thor, Loki, Angela umbrella, but it’s clearly going to be an essential one for the Marvel Universe moving forward. Actually released after Original Sin #6, but takes place in the immediate aftermath of Original Sin #2. Highly enjoyable return to Peter Parker from Dan Slott and co., in an issue that references J. Michael Straczynski and John Romita Jr’s AMS heavily. Seriously, if you haven’t read that early 2000’s series, you’ll want to catch up before the mega Spider-Verse event hits later this year. This issue is ultimately more tied to introducing Spider-Verse than Original Sin. Definitely read before Original Sin #6 and any assembling of Avengers. This Infinite Comic (think a comic that puts digital panel layouts and developments first) showcases Nick Fury (the new, Samuel L. Jackson inspired young one) dealing with his “original sin.” It’s a quality SHIELD romp that clearly occurs in the direct aftermath of Original Sin #2. Enjoyable Deadpool lunacy, but only ties into the event in the sense that Deadpool’s SHIELD crew witnesses the end of Original Sin #2. Loose tie-in. Released after Original Sin #4, but begins with the Avengers prior to Avengers #29. A looser tie-in that focuses on the Human Torch’s original sin against the Thing. Continues the awfulness of the Original Sin unleashed upon us in Fantastic Four #6. You definitely don’t need this issue for the main event plot, and probably only if you like beating dead horses. Shoehorns DD (now living on the West Coast) into the battle of Original Sin. Occurs before Avengers #29 based on the appearance of Hawkeye. Like most titles, thematically deals with Daredevil confronting a secret from his past. A continuation of the Daredevil “origin secret” started in #6. DD specific at this point and only Original Sin in theme. Jonathan Hickman’s run on Avengers has been wonderful, and these two issues tie back strongly to his take on the Illuminati: New Avengers. For those who have read New Avengers, Avengers #29 will start off strongly like a long recap, although with clear purpose. Captain America’s realization of what was done to him and his anger at Tony Stark sparks an essential Marvel Universe story in the making. It’s unclear at this point how deeply these events will tie into the main Original Sin event, but given that Hickman is dealing with a Civil War-esque internal Avengers conflict, it seems safe to say these are important books. At the very least, they’re wildly entertaining and recommended on their own merits. Issue #31 is actually released the same week as Original Sin #4. Nonetheless, you can read this story in conjunction with the other Avengers issues, as they remain in their own world and time, unimpaired by the events of Original Sin thus far. An alternative approach (now that Avengers #34 has been released) would be to read Avengers #31 – #34 after the core Original Sin event issues. It doesn’t totally add up chronologically, but it might just make for a more coherent read. See above above. Far flung future story involving Cap, Ultron, and comic book science philosophy! Take note that I don’t suggest reading Avengers #34 until all the way through Original Sin #7! The two-part Infinite Comic winds up not having much to do with the main plot line. It’s enjoyable enough if you like Nick Fury Jr. and Agent Coulson, and I’m always a fan of the digital tricks of Infinite Comics, but you don’t need this one to enjoy the event. Deal’s with the secrets revealed to Luke Cage about his father in the aftermath of Original Sin #2. Largely a throw-back noir 70’s series that continues the stories in Mighty Avengers #10. Not overtly tied to the Original Sin main event, but driven by the Watcher’s secrets. Continues the plot of issue #11. Uses the Sin bomb in Original Sin #2 to drive the plot, but otherwise operates independently. Decreasingly enjoyable Deadpool lunacy, but only ties into the event in the sense that Deadpool’s SHIELD crew witnesses the end of Original Sin #2. You don’t need this as part of Original Sin, only if you like reading Deadpool. This issue takes Original Sin to a whole new level. Holy smokes! A number of the tie-ins above (All-New Invaders, Mighty Avengers #11) are actually published after Original Sin #3. Nonetheless, they clearly occur in the direct aftermath of Original Sin #2 and can be read there. Reading ahead to Original Sin #3 will not spoil any of those issues, but it’s not necessary for story chronology. Three short stories dealing with the aftermath of the Sins released at the end of Original Sin #2. The opening Deathlok story is awesome and sets up a spy, sleeper agent story from Nathan Edmundson in October. That’s followed by new Young Avengers (yay!) dealing with the mess made by Marvel-Boy’s ex, the surprise Original Sin villain Exterminitrax. All in all, it’s a fun dive into the aftermath of Original Sin, and although it’s a little off the beaten path, one I’d recommend. Three more short stories, although really only Young Avengers is tied into Original Sin. Young Avengers continuing saga is book ended by a very interesting Black Knight story, and then a quick hit Howard the Duck snippet played for laughs. I’m still very much enjoying Original Sins, largely because it’s 2/3 a new Young Avengers title, and 1/3 previews for upcoming comics. This week tackles the Inhumans and a J. Jonah Jameson two-pager, alongside the continued adventures of Marvel Boy, Hulkling, and Prodigy. Continually one of my favorite titles in the entire Original Sin saga. This issue features an excellent Dr. Doom short story drawn by Alex Maleev. Should be read before Original Sin #4 based on the involvement of Rocket Raccoon. The book gets more focused on Nova’s discovery of his father’s original sin from here on out, and less closely connected with the overall event. Placed here based on the extremely impactful Nick Fury and Dum Dum Dugan short story. Suggesting Avengers #34 is read all the way after the core Original Sin issues above based on the Avengers apparent camaraderie in Original Sin. As noted above, technically this issue actually (likely) occurs before Original Sin #6 and #7 when Captain America calls in the Avengers. It is possible that he is simply masking his feelings about certain Avengers for the sake of dealing with the prime threat in Original Sin. Sure. I prefer this issue after the Avengers have dealt with Original Sin simply because it feels more coherent. If you do choose this approach, you could actually read Avengers #31 – #34 here. Chronologically you could likely read this Annual #1 after Original Sin #5. Nonetheless, the issue was published a full month and a half after the event’s conclusion, and reads as a coda to the series. The issue is extremely peripheral to the event and instead focuses on the past history that led Nick Fury to his role revealed in this issue. Honestly it felt unnecessary, but it elaborates on an interesting new concept in the Marvel Universe. An Original Sin tie-in strictly in the sense that it reveals a major GoTG secret. In this case, we finally start to get an answer to how Brian Michael Bendis’ run on Guardians fits within the story established by Dan Abnett and Andy Lanning (the whole, “I thought certain characters were dead now?” thing). Released weeks after Original Sin although still hanging on to the Original Sin tie-in banner. This issue continues the revelations of how the Guardians of the Galaxy came out of The Thanos Imperative so in tact. It’s going to drive a lot of Marvel Cosmic fans bonkers, but this is the first explanation since Marvel Now. As far as I can tell, you can read the start to “The Last Will and Testament of Charles Xavier” at any point. So far it’s more closely aligned with Secret Invasion than Original Sin. Placing here to align with publishing schedule. “The Last Will and Testament of Charles Xavier” is particularly interesting if you’re invested in the post Avengers vs. X-Men world of mutants. If not, it’s only really tied into Original Sin thematically, with yet another “sin” of Charles Xavier’s. How Essential a Tie-In Is This? : 5.o out of 10 – Not big for Original Sin, but important for the Marvel Universe as a whole. Would you recommend reading it in order like this or reading it per character/story arc? If I am just reading the Hickman Avengers/New Avengers to lead into Secret Wars, can I skip the non-Avengers tie-ins and just read the Original Sin main issues? Do the other tie-ins add anything to the Secret Wars narrative? Ive recently found a mini series called operation sin where would this slot in? Hola, Dave! Just a quick comment or two about this format. Pro: I like reading how relevant the tie-ins are to the event main. Though I’ll prolly read them anyway. Con: When I print it out, it makes it a relatively humungous amount of pages. And I have to print it out so I can check them off once I read them. I’m not much of a binger I guess and I do read other comics inbetween. It’s hard to check them off if I don’t print the guide and it leaves deep gouges on the moniter. So, what’s up with the Operation S.I.N. arc? is that now also part of Original S.I.N. or not? The problem is,if want to read Avenger 29-34 first before Original Sin 1-8,it make doesn’t sense at all the timeline. It’s the most confusing continuity muddle of the event for sure. I believe in the order above, I suggest you read all the Avengers issues through #33 shortly after Original Sin #2, but then hold off on #34 until after Thor experiences hammer dysfunction. Nothing feels quite perfect but that felt like the best fit. Thanks for the suggestion. I will have to consider! Thor & Loki: The Tenth Realm #5 ? Guardians of the Galaxy #20 ? after the last of each issue ? Yeah, you got it. Curse marvel and their post event releases! put those three at the end of the list, or after the last of their respective titles? You’re missing Thor & Loki #5. Was great to read everything in the end. Now we need to wait to fill the void with the “8 months after”. Great guide as usual. I especially like how you rated the relevancy of each tie in. Thanks for the feedback! That was my first guide where I played along live so glad it’s helpful. Doing the same now with Axis!